We can all agree that aesthetic is an important part of meals. When a dish makes me drool just by looking at, that’s a plus. At least until the first bite. In today’s age of Instagram visual appeal has become an even more important part of marketing and how restaurants gain popularity. However, taste is still key and should be the primary focus. No matter how pretty a restaurant’s interior is, how many succulents they house or how many edible flowers they use to plate, if the food tastes only ok, I just don’t see longevity. Aburi Room had a lot of promise. High quality torched sushi at a mid-range price and their aesthetic was on point (especially the takeout option). After eating lunch there, I’m not super surprised they’re already re-branding. 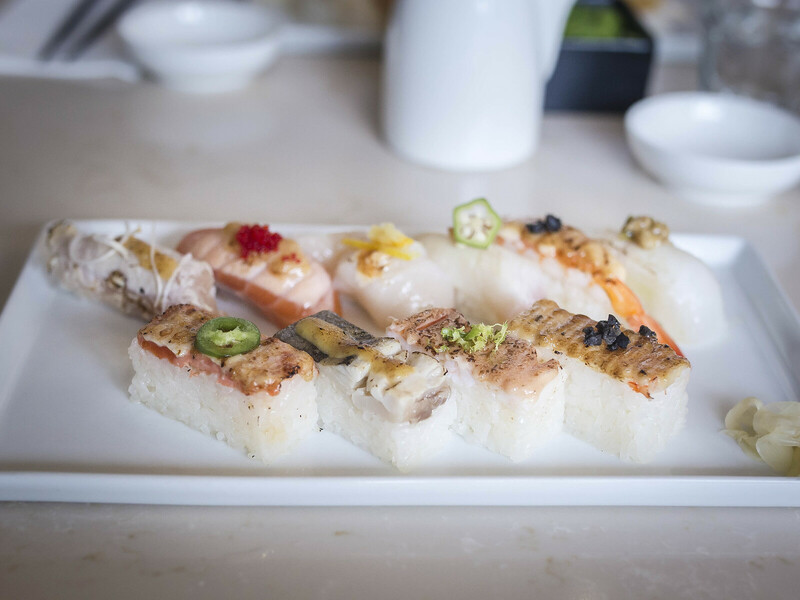 Atmosphere: Located in the first floor of a condo in North York, I was excited to venture back to our old neighbourhood for lunch at Aburi Room. This was one of our first outings with Alivia and I scoured pictures online to make sure there was plenty of room to fit a stroller next to our table. We made a reservation for 11:30am, right when doors opened and were the first diners seated. Tables were nicely spaced out with a few for large groups and comfy armchairs. Decor was modern with lots of greenery, pendant lights with an exposed industrial ceiling. Lunch was relaxed and busy but not to capacity. Service: Our server was friendly and patient. Being our first time out in awhile, we were busy catching up with friends and took some time to decide on our order. The pace of the meal was comfortable and when our Smoked Chirashi Tart arrived, she was happy to wait for Stephen to get his camera and pose for our shots. Our reservation was made with a baby and our table had been set up with a high chair, an added touch that I now truly appreciate. Food: After my lengthy intro I have to start with, the meal was good. Not amazing, but pleasant. 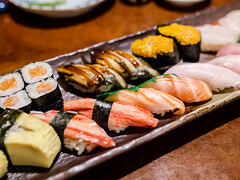 My biggest challenge with the Omakase at Aburi Room was that for the price, I’d much rather spend either a bit more for amazing quality and fewer pieces (lunch at JaBistro $28 for 7 pieces) or much less for quantity ($15 Chirashi from Ichiban on Spring Garden). 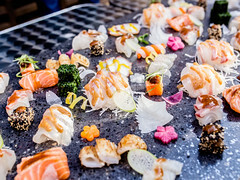 The menu relied heavily on the trend of aburi style sushi and presentation to distinguish themselves, which almost worked. It’s a hard neighbourhood to compete in when there are multiple Japanese restaurants every block. Stephen and I both ordered the Signature Omakase (10 pieces + 2 hand rolls) for ourselves and split a Smoked Chirashi Tart with our friends. 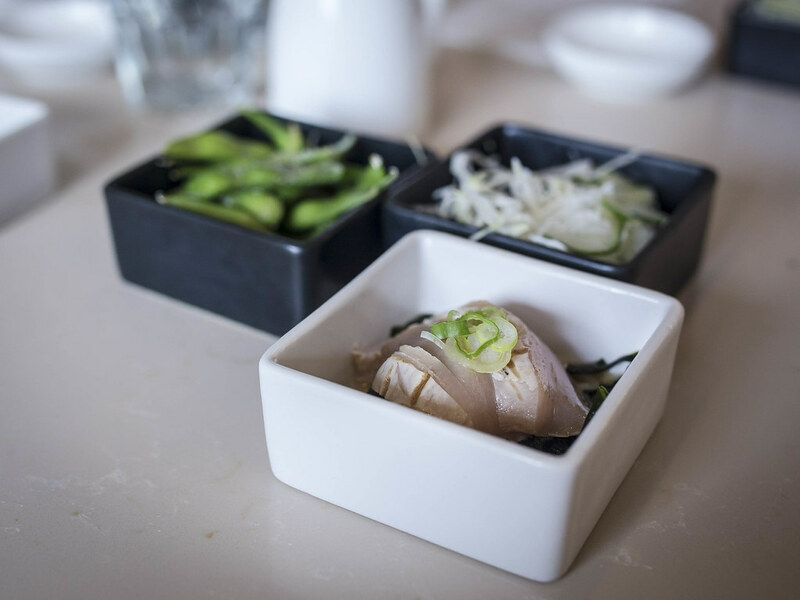 First to arrive were three square bowls with edamame, a cabbage salad and two slices of sashimi on seaweed. 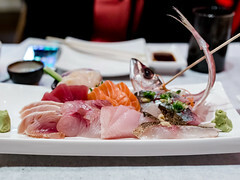 The sashimi was a white fish, very fresh and sweet; a good start. 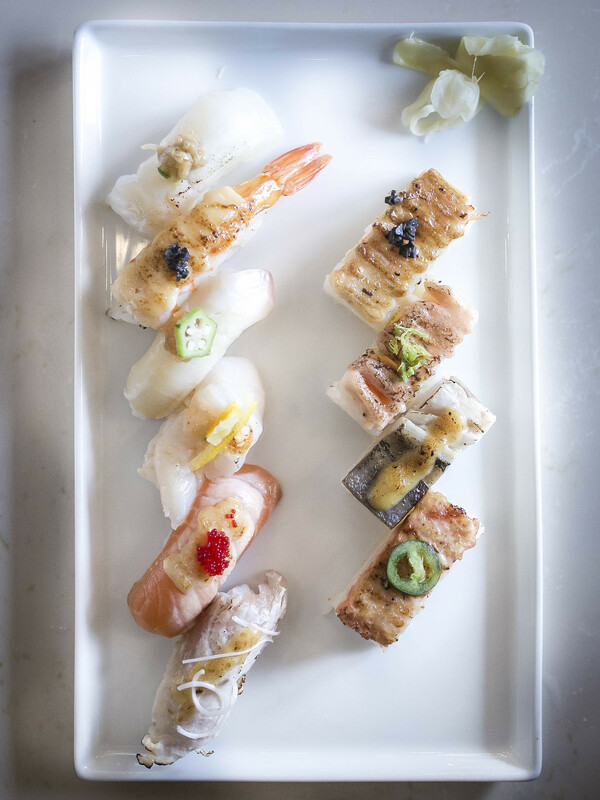 The 10 pieces of aburi sushi was served on a rectangular white plate. There were 6 pieces of torched nigiri and 4 pieces of pressed, then torched sushi. Each piece was paired with a unique garnish ranging from jalapeno to tobiko and a thin slice of okra. 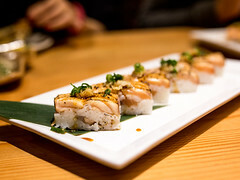 I really enjoyed the salmon and truffle shrimp sushi, which were sweet and flavourful. The yuzu peel garnish on the scallop was interesting, a tart and bitter contrast to the sweet seafood. I liked it but not everyone at the table agreed. With the pieces of pressed sushi the layer of mayonnaise was generous and caramelized to a delicious flavour after being torched. However, it did mask the flavour of the fish a bit and all the pieces aside from mackerel tasted the same. I admit, I ordered the Smoked Salmon Chirashi for the visuals and it did not disappoint in that department. 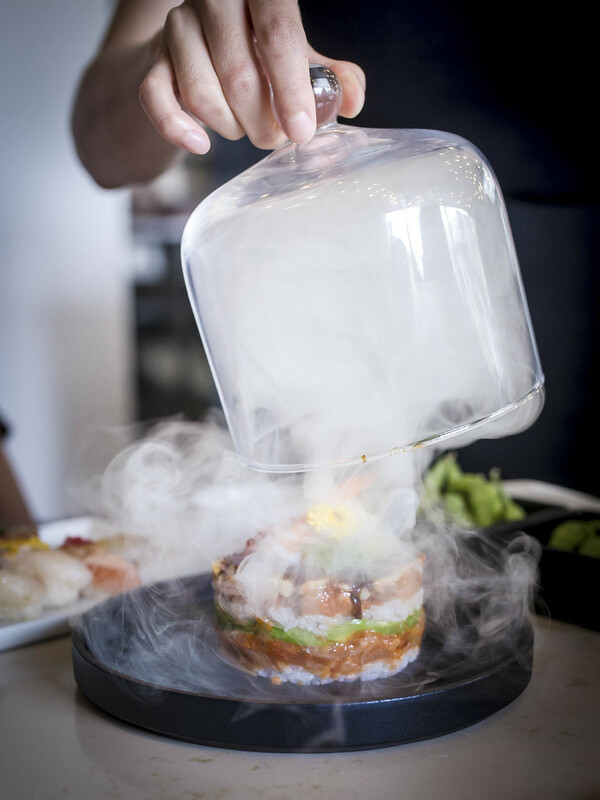 Served on a round plate under a glass dome filled with smoke, presentation was on point. As for actual flavour, there was a lot of sauce. 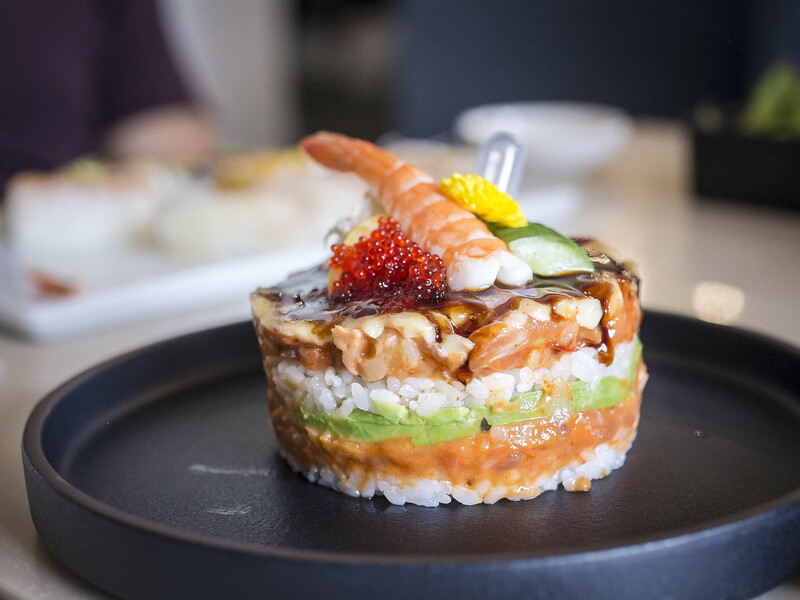 The layered tart of rice, chopped salmon sashimi and avocado was smothered with spicy mayo and nikiri sauce. This was not a subtle dish and I couldn’t really taste much smokey flavour. 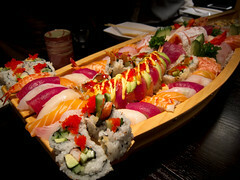 We had almost forgotten about the two hand rolls when they arrived, which were filling and completed the meal. A piece of tamago would have been a nice touch. Overall, lunch at Aburi Room was good and I am happy to have tried the omakase. I’m interested in seeing how the restaurant evolves as there is a lot of potential.